Last week brought one ARC in the mail. This week, I expect to have at least one review up since I’ve almost finished my review of Marie Brennan’s wonderful book A Natural History of Dragons. After that, I’ll probably start working on my review of The Goblin Emperor by Katherine Addison even though that means I’ll be putting up two very positive reviews in a row (these are two of my favorite books I’ve read this year). On to this week’s book! This fantasy novel is available now in the UK and Canada and is scheduled for hardcover/ebook release in the US on July 1 (although both Barnes and Noble and Amazon list is as being available July 15). 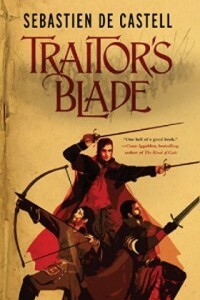 An excerpt from Traitor’s Blade can be read on Tor.com. In the first of a new fantasy series by Sebastien de Castell, a disgraced swordsman struggles to redeem himself by protecting a young girl caught in the web of a royal conspiracy. Falcio is the first Cantor of the Greatcoats. Trained in the fighting arts and the laws of Tristia, the Greatcoats are travelling Magisters upholding King’s Law. They are heroes. Or at least they were, until they stood aside while the Dukes took the kingdom, and impaled their king’s head on a spike.Now Tristia is on the verge of collapse and the barbarians are sniffing at the borders. The Dukes bring chaos to the land, while the Greatcoats are scattered far and wide, reviled as traitors, their legendary coats in tatters. All they have left is the promise they made to King Paelis, to carry out one final mission. But if they have any hope of fulfilling the king’s dream, the divided Greatcoats must reunite, or they will also have to stand aside as they watch their world burn.